Creative destruction occurs when something new kills something older. A great example of this is personal computers. The industry, led by Microsoft and Intel, destroyed many mainframe computer companies, but in doing so, entrepreneurs created one of the most important inventions of the century. Improved, free medical training facilities, such as the short videos provided by the Khan Academy. Topol has an impressive track record as a leading medical practitioner, and gives every sign that he knows what he is talking about. Importantly, he maintains a critical, skeptical perspective. He gives plenty of examples of where technology has gone wrong in medicine, as well as when it has done well. His observation of the application of accelerating technology to medicine is far from a utopia. There are two sorts of problematic factors: technology factors (including the complexity of the underlying science), and non-technology factors. First, the technology factors. The ways that individuals react to different medical treatment vary considerably: a drug that saves one life can have terrible side effects in other patients. What’s more, diseases that were formerly conceived as single entities now appear to be multiple in nature. However, the move from “population medicine” to “individual medicine”, enabled by advances in genomics and by powerful data analysis, offers a great deal of hope. For one example of note, see the Wall Street Journal article, “Major Shift in War on Cancer: Drug Studies Focus on Genes of Individual Patients“. The core principle is that of ever improving digital analysis of data describing individual people – something that Topol calls “digital high definition of humans” leading to “hyperpersonalisation of healthcare… fulfilling the dream of true prevention of diseases”. But the non-technology factors are just as significant. Instead of the complexity of the underlying science, this refers to the structure of the medical industry. Topol has harsh words here, describing the medical establishment as “ultra-conservative”, “ossified”, and “sclerotic” – existing in a “cocoon” which has tended to isolate it from the advances in information technology that have transformed so many other industries. Topol calls for “an end of the medical priesthood… the end of an era of ‘doctor knows best'”. Associations of medical professionals who seek to block patients from seeing their own medical data (e.g. a detailed analysis of their personal DNA) are akin, Topol says, to the medieval priests who fought against the introduction of printing and who tried to prevent church congregations from reading the bible in their own hands. and many others. And for a growing list of reviews of the book, including from many people deeply embedded in the medical industry, see this compendium on the 33 Charts blog. What’s happening here is that Topol is drawing attention to structural issues inside the medical profession, which many other people recognise too. This includes risk aversion, long training cycles that place little emphasis on information technology, funding models that emphasise treatment rather than prevention, tests that are unnecessary and dangerous, and lengthy regulatory processes. With the personal montage of your DNA, your cell phone, your social network – aggregated with your lifelong health information and physiological and anatomic data – you are positioned to reboot the future of medicine. Topol advocates patients take advantage of the tremendous computational power that is put into their hands by smartphones, running healthcare applications, connected to wireless sensors, and plumbed into increasingly knowledgeable social networks that have a focus on medical matters – sites such as PatientsLikeMe, CureTogether, and many others. There’s an important precedent. This is the way business professionals are taking their own favourite smartphones and/or tablet computers into their workplaces, and are demanding that they can access enterprise systems with these devices. This trend – “bring your own device” (“BYOD”) – is itself a subset of something known as “the consumerisation of enterprise technology”. People buy particular smartphones and tablets on account of their compelling ease of use, stunning graphics, accessible multimedia, and rich suite of value-add applications covering all sorts of functionality. They enjoy using these devices – and expect to be able to be use them for work purposes too, instead of what they perceive as clunky and sluggish devices provided via official business channels. IT departments in businesses all around the globe are having to scramble to respond. Once upon a time, they would have laid down the law, “the only devices allowed to be used for business are ones we approve and we provide”. But since the people bringing in their own personal devices are often among the most senior officials in the company, this response is no longer acceptable. Just as people are bringing their favourite smartphones from their home life into their business life, they should increasingly be willing to bring them into the context of their medical treatment – especially when these devices can be coupled to data sensors, wellness applications, and healthcare social networks. Just as we use our mobile devices to check our email, or the sports news, we’ll be using these devices to check our latest physiological data and health status. This behaviour, in turn, will be driven by increasing awareness of what’s available. And Topol is on a mission to increase that awareness. Hence his frequent speaking engagements, including his keynote session at the December 2011 mHealth Summit in Washington DC, when I first became aware of him. (You can find a video of this presentation here.) And hence his authorship of this book, to boost public understanding of the impending inflection point in medicine. The more we all understand what’s available and what’s possible, the more we’ll all get involved in this seismic patient-led transformation. Footnote: Topol’s book is generally easy to read, but contains quite a lot of medical detail in places. 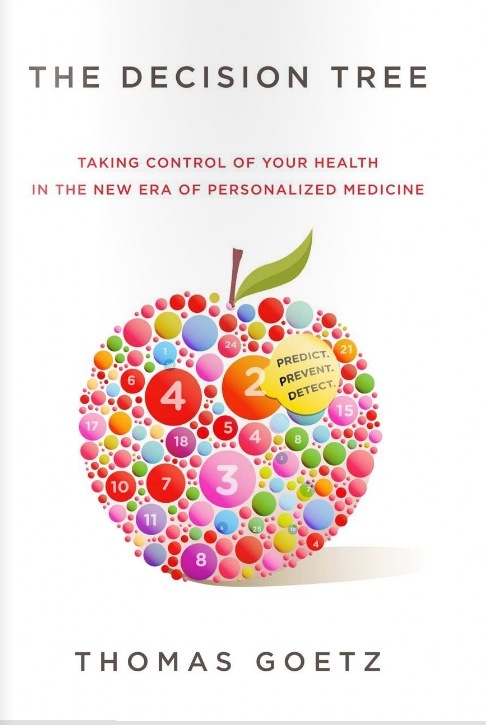 Another book which covers similar ground, in a way that may be more accessible to people whose background is in mobile technology rather than medicine, is “The Decision Tree: How to make better choices and take control of your health”, by executive editor of Wired magazine, Thomas Goetz. Both Topol and Goetz write well, but Goetz has a particular fluency, and tells lots of fascinating stories. To give you a flavour of the style, you can read chapter one free online. 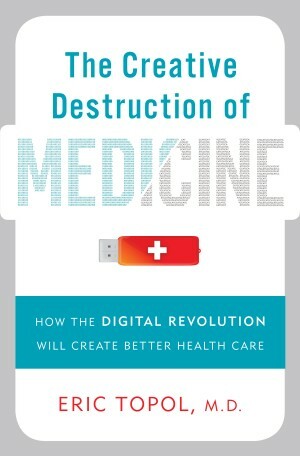 Both books emphasise the importance of allowing patients access to their own healthcare data, the emergence of smart online networks that generate new insight about medical issues, and the tremendous potential for smartphone technology to transform healthcare. I say “Amen” to all that. Interesting review David. I agree with the conclusions. One aspect also worth considering is how the fine nuances of user experience design can make the difference between achieving the potential health benefits of new technology and failing to make them sufficiently accessible to customers. It is something we’ve been exploring in MEX Pathway #5, discovering along the way how emotionally charged the issue of technology and health can be and how most health products actually need to be designed for multiple different simultaneous users (e.g. Patient, carer and prescriber). The latter, in particular, makes it difficult to achieve the quality of experience required to encourage easy adoption by all users and avoid the additional costs which accrue when systems are too complex and end up requiring supervision. I share your findings: people being flustered with unsettling UX on mobile devices is bad news in any context, but is particularly bad news when they are already anxious on account of health worries. At Accenture, interestingly, some of the mobile healthcare solutions we’re developing have come under pressure to bifurcate and even trifurcate into different apps, in order to most effectively address the differing needs of “patient”, “nurse”, and “doctor” personas.